Do you need an Albany professional photographer who specializes in business photography? In your search for a professional photographer in Albany, are you finding the type of photographer you need for your specific project? One who photographs the types of things you want photographed? It’s a pretty broad search term, searching by using the words “professional photographer.” Or “professional photos” in a particular city. There are so many areas that a photographer may specialize in or concentrate on. And what someone photographs as their main area of interest or specialization may not be a type of photography that you need. You need a specialist for whatever project you need photographed. Someone who specializes in work for consumers likely won’t be the right person to handle an assignment for a corporation that wants to create marketing content. Or images for their main website. Think of people who do landscaping here in the northeast. If you wanted some beautiful plantings, well there are folks who have a lot of experience with what works in this area and understand the species that are native or will work best for our conditions. Now take that person to the desert southwest. They are still a landscaper, but likely have zero knowledge of how to work in that environment. They still understand some of the basics, which still apply. They just don’t have the skill and knowledge to be successful in that very specific environment. First and foremost, I am a full time pro. For my entire career, one hundred percent of my income has been derived from working as a photographer. No … I’m not counting that invaluable time I spent in college running a summertime house painting business as part of my entire working life as it wasn’t full time. But I do value the time I spent during those summers, learning about business, marketing, and customer service. All while being one of the two person team who produced the “work product” that we sold to our customers. I have a photography-centric education from Syracuse University. While enrolled in the S.I. Newhouse School of Public Communications, my course of study was in photojournalism. This involved receiving a broad liberal arts degree with a strong component of journalism and another strong component of photography theory and technique added on top of it. In many photography schools, a person will receive a couple year degree that concentrates on learning photography technique by rote. While there was some of that, my degree required English courses as well as foreign language fluency. Mathematic proficiency through calculus was a requirement as well. And on top of all that were added the writing, researching, law and ethics courses that journalism requires as well as photography history, technique, theory and practical application. And with that degree, I have come to a point in my lifelong career where I specialize in providing the types of photography that businesses need. This may mean working directly for a business or perhaps an intermediary agency. But the work ends up being very similar. My photos are used for advertising, marketing, public relations, corporate communications and in trade magazines. Either directly by a company or through a business publication group, an ad agency, a public relations agency or a corporate communications department. In my portfolios you will not see any photos created to fulfill the needs of the consumer market, whether it is for portraiture or for documentation of life-milestone events and gatherings. And you won’t find scenic images taken for the pure documentation of a pretty scene. Instead you will find photos that ad agencies and trade magazines and communications departments will use. 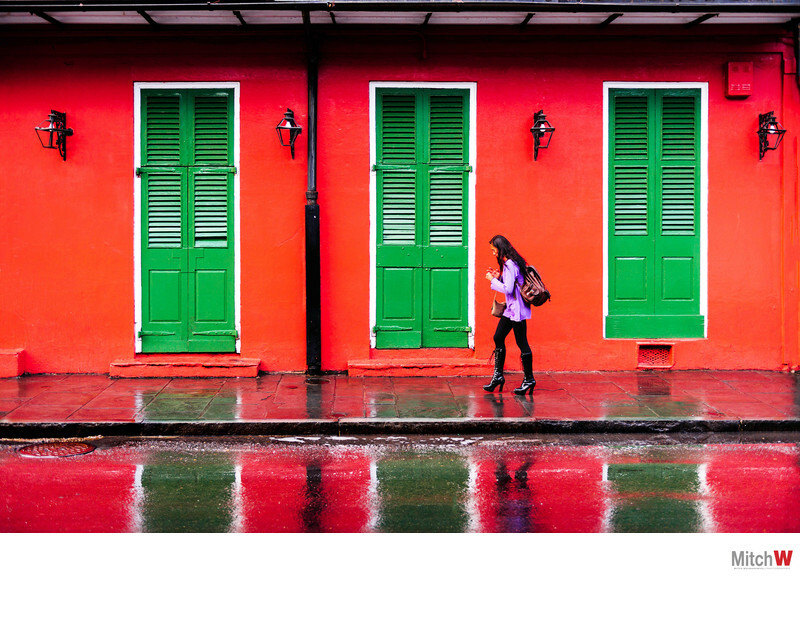 A case study of this editorial photo taken in New Orleans. One component of being the type of photographer I am is that I work for a lot of editorial publications. This work may require me to work as a pure documentarian, going back to my foundation as a photojournalist. And sometimes a company will hire me too capture the flavor of a community or location where they may have an office or may be holding an event. And that was the case here. It’s a bit of pure documentation for the end client. But the image speaks to my aesthetic of color and structure in my images. You see, my work is based on color, shadows, contrast, colors that contrast as opposed to being desaturated or bright and soft. I’ll take directional light any day, along with some bright colors. And why use this image as one that is representative of me as a professional photographer? Because of what it isn’t. It isn’t random personal work, it isn’t done directly for a consumer, it isn’t soft and ethereal or desaturated and trendy. It is a choice made to show you that there are so many different directions a photographer can go, that you need to be careful in defining what it is you are looking for so that you can find someone who has the skills that match with what you need. Hey that’s a pretty strong claim, no? But clients have ranked me among the best in this region of New York State because I offer a style, a focus, a vision and a way of working that set me apart. What I do likely won’t appeal to everybody nor should it. But for the people to whom it appeals, I can bring home a fantastic set of images to match your communications needs. Feel free call me at 1 (518) 843-0414. Since I’m not a studio photographer there is only a bit of a chance I will be sitting around waiting for the phone to ring. I’ll likely be out doing what a commercial and corporate photographer does. And that is the un-glamorous stuff required to run a full time business. It is in addition to doing all of the fun and glamorous things such as hauling a bunch of gear to some location where I get to make photos of somebody or something fantastic. Call me to walk through any ideas you might have. Or you might want to get my take on how to approach a shoot your are considering. I like to talk about that sort of stuff.